How can I be more creative. That’s the request — sometimes a plea — that I hear most often. It’s the question that the Go Creative! book series was written to answer. These books go on sale in January. To lead in, I’m doing an A to Z series that will introduce some of the concepts and hear about your own experiences and ideas. I hope that you’ll find the series useful and enjoyable. Questions and comments are welcome, in the guestbook or below. 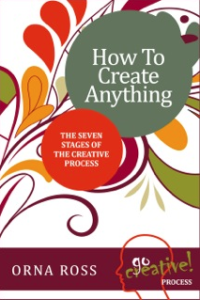 And in the meantime, here’s an extract from How To Create Anything: The Seven Stages of The Creative Process to whet your appetite. Creative Infancy: True Wants – Intuition. Creative Childhood: Dreaming Wonder – Fantasy. Creative Adolescence: Active Observation – Research. Creative Adulthood: Reasoned Orchestration – Expression. Creative Early Midlife: Selective Amplification – Simplicity. Creative Late Midlife: Mindful Acceptance – Surrender. Creative Aging: Detached Revelation – Letting Go. Countdown to Christmas: Anne Sexton's "Christmas Eve".